The Geometry Gym Grasshopper/Rhino plugin to generate and import Tekla model data will be presented by RhinoForYou and Decode at the France Tekla User Days in Paris and Toulouse. Decode will be explaining the use of the connector to generate fabrication data from Grasshopper for the impressive Canopée des Halles de Paris project. Hopefully I can post details on this here soon for those unable to attend. I'm pleased to have the opportunity to implement something I've discussed with quite a few Architectural offices in the past. Coordination and duplication of models is a really time consuming aspect of working in a Design Team. And despite the best efforts to date, success has been limited in sharing or using a single model for cross purposes. Say an architecture office has prepared a great 3d model of a project, and then asked the Structural Engineer to analyze it and provide advice. Structural Analysis models are quite fussy, and are only an approximation (to some extent) of the physical entities it represents. An analytical model requires clean "junctions" or in effect ends of members tied into "nodes" to not have unsupported parts that don't participate in the frame stiffness. 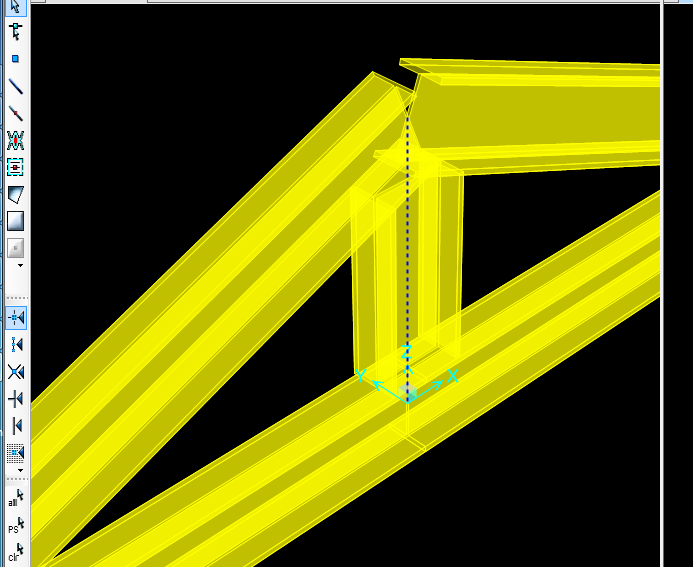 The physical reality has junctions where members are "cut" apart from the junction, or offset locations (say purlins sitting on top of a joist) and a BIM model should represent the physical situation as accurately as possible. Because a structural analysis model is an approximation, care is not usually take to "precisely" replicate element position. So the Structural engineering team leading the modelling process is also quite often not successful. The advancement in software such as Revit (release 2012) had particular emphasis on an intelligent analytical representation trying to detect the physical situation. I've been planning on implementing something similar, and now have a commercial user prepared to embrace this model transfer. Note there are other aspects such as responsibility and other legalities that mean team work and close working relationships are essential to this process. If engineering makes you a little squirmish, look away now. This isn't really for the faint hearted. But it has the potential to save hours and hours of duplicated effort or coordination if used successfully. I can't wave a wand and make technical requirements of a model disappear, but I (and other software developers) can make them as easy as possible to incorporate into the process. The attached model is a simple and crude truss. The vertical member is physically modelled short of the chords. The IFC components that define the analytical model are input with a "sphere radius" to search for other members terminating in this region. An eccentricity or end offset is created joining the member to the other elements in the analytical model. Mathematical stability and intended behaviour without explicitly having to identify the end offsets, demonstrated here in SAP2000 import. The IFC model contains physical and analytical representations. I hope that the "OpenBIM" structural analysis software soon recognizes this aspect of IFC. To enable the Structural Engineering office to open the IFC model, I've developed an importer for SAP2000 (I'm happy to do similar for any of the other structural analysis software I've developed links to). Attributes including constraints, releases, loads, material and profiles can all be conveyed. This is just the beginning, lots more to implement on this process. Note IFC4 has some subtle improvements that means I'm primarily targeting this version of IFC. Here's the Grasshopper model, and IFC file. If you're interested in a Structural Analysis importer (Such as to SAP2000), please get in touch. It's been a little while since the last update, but I have been working on some subtle and not so subtle improvements. 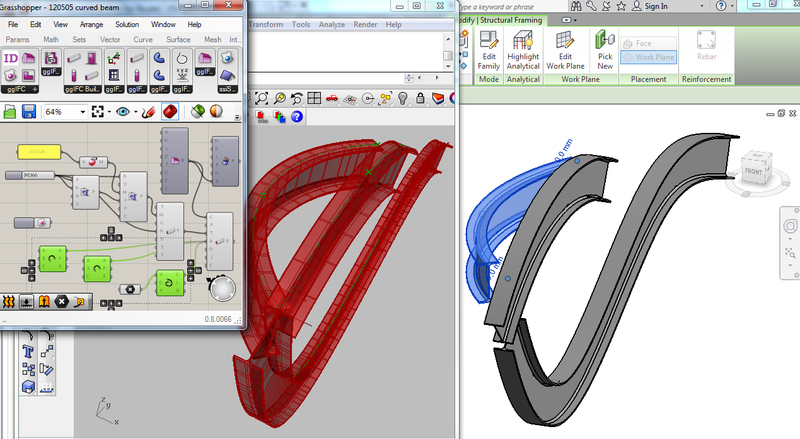 The primary new feature is the ability to generate and import to Revit beams with curvature (arc and splines). This includes preservation of cardinal points. For the time being it works with IFC4, I will enable IFC2x3 initially with mid cardinal point. At present the axis curve must be planar, but if you need non-planar I'll take a look at it. If you look carefully at the image (or try for yourself the models), then you'll see Revit alters the end details at the junction. These elements using the IfcSurfaceCurveSweptAreaSolid shape representation, which is totally under utilized in my opinion. I've seen some client models where IFC is not practical to use due to bloated file size from faceted brep shape representations of these parts. Here's the Grasshopper file, and here's the IFC file.